Hope everyone had a nice Thanksgiving! As you can probably tell, I’ve been taking a break from blogging over this weekend to try and recharge a bit. I love my blogs, but they can eat up a lot of time and be very tiring. I wanted to also let everyone know about the new challenge I’ve decided to take up for 2014 – yep, it’s never too late to start preparing for the next year! 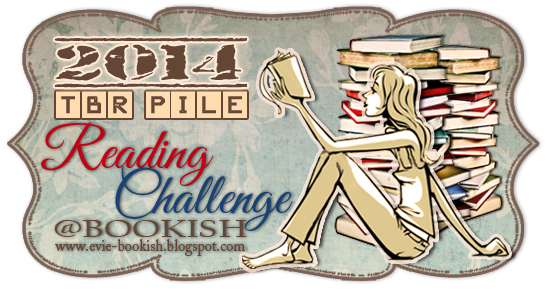 I will be participating in the 2014 TBR Pile Reading Challenge over at Bookish. I’m not sure what my goal for this will be yet, but according to GoodReads, I own 24 books that are currently on my TBR pile. This is, of course, not counting the other books that I have listed as TBR that I don’t own yet. So for right now, I will aim for 24 books. This might change once I figure out some other goals for next year. Anyone else want to join? Just click the link above, or go to Evie’s website, and sign up. I’m following you now so I can keep an eye on your progress. Have fun! Yay! I’ve followed you back. Happy New Year!